This schematic covers the complete Rainbow E-2 (e SERIES™) second version main housing that includes the face plate, rear cover assembly, latches, and HEPA filter. Effective serial number 9280000 with a start date of March 27th 2000 through serial number 9999999 and an end date of September 3rd 2003. We have detected you're on a small or mobile device, therefore the interactive image map has been disabled. All items are listed below. Click on any number below to see more details. Main housing for the E-2 (e SERIES™) Rainbow system. This is the SECOND VERSION design for the single speed. The FIRST VERSION is no longer available. 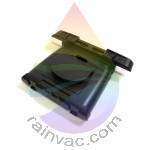 This main housing works with the R10520 HEPA Filter. If you have the FIRST VERSION Rainbow that has serial number 9000000 with a start date of August 5th 1998 through serial number 9279999 and an end date of March 26th 2000, then you need to order all items in the "Related Items" tab. If your original VERSION ONE housing serial number is higher than 9049289, then you DO NOT have to order the R10525 Face Plate Assembly. Call our technical support team if you have any questions. Small applique for the left side of the main housing on the E2 Type 12 (e2 Gold) version Rainbow. Be sure to understand the left housing from the right as this will on fit the one side. The schematics page can help you find the correct location. Right baffle assembly for the E-2 (e SERIES™) and the E2 Type 12 (Silver, Gold) main housing that stores the separator wrench / brush. Does not fit the e2 Black (E2 Type 12) version. Includes the R7141 latch spring, R7139 latch pin, and the R8063 latch. Obsolete items numbers include R12102, R8062, and R7281. These numbers are stamped behind the latch on some assemblies. Factory OEM latch sub assembly for the E2 Type 12 (Silver, e2 Gold), and E-2 (e SERIES™) version Rainbow models. Does not fit the version e2 Black (E2 Type 12). Original production had an R7137 and/or R7138 stamped on the inside. This item is an upgraded factory part. Latch pin that fits the E2 Type 12 (e2 Black, Silver, Gold), and E-2 (e SERIES™) version Rainbow systems. One side is rough and the other side is smooth. Use a small hammer and punch to hit the smooth side to remove. The rough side is what cuts into the plastic to hold into place. Latch pin spring that fits the E2 Type 12 (e2 Black, Silver, Gold), and E-2 (e SERIES™) version Rainbow systems. Helps keep the latches up out of the way to prevent latch from hooking the water pan when trying to remove main unit from water pan. Left baffle assembly for the E2 Type 12 (e2 Silver, Gold), and E-2 (e SERIES™) main housing assembly. Includes the R7141 latch spring, R7139 latch pin, and the R8063 latch. Obsolete item number is R7280 and may be stamped behind the latch on some assemblies. Latch pin that fits the E2 Type 12 (Black, Silver, e2 Gold), and E-2 (e SERIES™) version Rainbow systems. If you can look into the hole where this item should be located and you see silver, then this part is missing. Interlock switch for the E2 Type 12 (e2 Black, Silver, Gold), and E-2 (e SERIES™) Rainbow vacuum. This switch is used as a safety feature so not to allow the Rainbow to turn on without the water pan attached. This water pan neck gasket helps seal the unit to prevent air leaks which will decrease performance. Water pan neck gasket that fits the E2 Type 12 (Black, Silver, e2 Gold), and revised first version and second version E-2 (e SERIES™) Rainbow systems. Effective serial number 9230146 with a start date of March 17th 2000. Small gasket to help keep water from the interlock plunger and switch. This part was discontinued with the upgrade to the current R11316 gasket system. Motor mount and water pan gasket for the single speed E-2 (e SERIES™) Rainbow vacuum. Works in combination with the R10534 water pan neck gasket. Effective serial number 9230146 with a start date of March 17, 2000. Previous version does not have the outer lip and uses a separate gasket that is glued directly to the main housing. Wiring harness for the E-2 (e SERIES™) Rainbow vacuum system. Does not include the main power cord. The power nozzle receptacle leads on this harness are now two small flag terminals instead of the larger block style. Unfortunately this item is not obtainable in the U.S. or does not apply to the 110-120 volt version. If you have any questions, please Contact Us or call 800-523-0510. Motor seal for the E-2 (e SERIES™) Rainbow system. This item has been improved to allow a better seal between the motor and lower housing. This improvement works with the R7214 housing clamp. Look at all images close to see if it matches your current part. The new design had raise studs to allow the improved design R7214 to press down trap the motor to the main housing. Clamp ring segment for the E-2 (e SERIES™) Rainbow to hold the motor to the main housing. This small black screw is the standard clamp ring screw for the E-2 (e SERIES™) Rainbow. Housing clamp for the E-2 (e SERIES™) Rainbow system. This item has been improved to allow a better mount between the motor and main housing. This improvement works with the R7209 motor seal. Look at picture close to see if it matches your current part. The new design has a smaller inside diameter to allow pressure to be placed on the raised studs on the new design motor seal. This allows for the motor to be trapped against the main housing without the need of glue on the water pan gasket and main housing. This common screw fits several model Rainbow vacuums. View schematics for details or call our technical support team for more information. 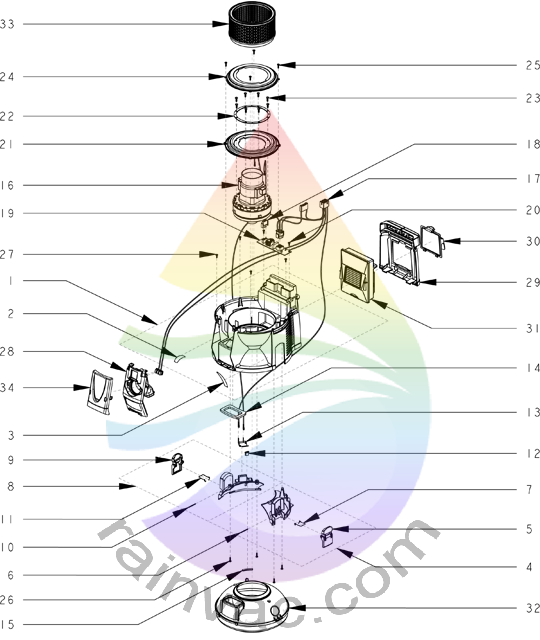 Common screw that fits several areas on the E-2 (e SERIES™) model Rainbow vacuum. View schematics for details or call our technical support department for more information. Faceplate assembly for the second version E-2 (e SERIES™) Rainbow. This item requires two screws in the bottom of the faceplate for installation. 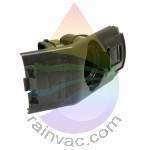 This item includes the R9709 water pan neck that has a flange molded to it. Effective serial number 9049290 through 9421763 with an end date of October 26th 2001. Faceplate assembly for the late version E-2 (e SERIES™) Rainbow system. This version does NOT have screw holes to mount to main housing. This design snaps into place. If you are replacing this assembly on an early E-2 (e SERIES™) Rainbow that has (2) screws below the intake port, then this is NOT the correct part. Effective serial number 9421764 with a start date of October 26th 2001 through serial number 1000000 and an end date of September 3rd 2003. This is the complete rear cover assembly for the E2 Type 12 (e2 Silver, Gold), and second version E-2 (e SERIES™) Rainbow that snaps onto the back of the main unit. Comes complete with cord caddy assembly. If you have the early version E-2 (e SERIES™) that uses four screws to attach the rear cover assembly, then this is the wrong part. Please order item number R7384. Effective serial number 1000024 with a start date of December 5th 2003, this item was modified and can no longer be removed by hand. You will need to use a flat blade screwdriver and press up on the (2) latches to remove. Do this while pulling away and upward from the Rainbow. In some cases, this item has the number R10594 stamped into it on the inside below the exhaust cover. Exhaust vent plate for the model E2 Type 12 (e2 Silver, Gold) and E-2 (e SERIES™) Rainbow. This part has been improved over the years by first adding a cord wrap hook and then adding an opening behind the cord wrap hook to allow for better airflow and performance. Obsolete part numbers include R-7285, R-9555 (No cord wrap hook), R-10516 (No port hole). Original OEM factory True H13 class HEPA filter (Neutralizer) for the single speed E-2 (e SERIES™) Rainbow unit. If you have to remove four screws to replace your filter, this is the WRONG PART! Click here to go to correct part. The bulk item number for this is R12106B. Some websites list this part number for a single item which is incorrect. It is better to toss your old filter and not replace it than to buy a generic filter. Generic filters do very little for the air quality while reducing your airflow and performance. This is the original OEM factory 2 1/2 quart water pan for the E2 Type 12 (Black, Silver, e2 Gold Series), and E-2 (e SERIES™) Rainbow vacuum cleaning system. We do not sell aftermarket water pans as reviews and experience have shown them to be inferior in quality and more likely to break. We also offer a larger 4 quart water pan that is nice when picking up a lot of dirt as it gives more water for the dirt to filter through. It also allows for more water pickup when you have a spill or are shampooing. Check out the "Related Items" tab to view. Original item number R7876 was a 2 quart design before it was replaced with this larger standard 2 1/2 quart version. The early version also had a silver warning label with item number R6853 in lower corner. 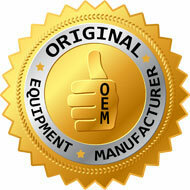 OEM factory original cooling air filter for the E-2 (e SERIES™) Rainbow system. This filter has made several changes over the years and could look different than what you currently have. Original version has four legs on the bottom that have been removed in the revised design. The new design has a soft gasket on one side. This gasket side lays over the existing motor wires without fear of damage. Some versions have R10510, R7289, and R7288 stamped into them. This item is the current factory replacement. The bulk item number for this is R12096B. Some websites list this part number for a single item which is incorrect. Airflow adaptor for the E2 Type 12 (Black, Silver, e2 Gold), and E-2 (e SERIES™) model Rainbow. 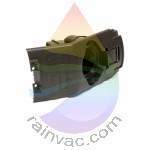 The airflow adaptor helps reduce a whistle noise that could be created while running the Rainbow without a hose connected. R8516 and R8436 is an old item number stamped inside some early versions.